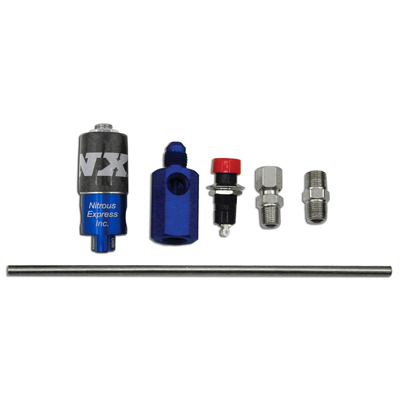 The NX Purge System is designed to purge the air from your nitrous lines to allow immediate activation of your Nitrous system. This System includes a Lightning solenoid, push button for activation, and a vent tube to direct the purged nitrous out of the solenoid. Also included is a -4 AN manifold to run inline with your nitrous feedline,this allows you to purge the nitrous system, even when you do not have a purge port built into your solenoids. The Purge system can also be used to lower the bottle pressure for spot on nitrous performance ever time you activate the system. No one else gives you the bold clean styling of our Aftermarket Dress Ups, Suspension and Performance Parts for your American Muscle Car like UPR Products! Fits these Vehicles: 1979 1980 1981 1982 1983 1984 1985 1986 1987 1988 1989 1990 1991 1992 1993 1994 1995 1996 1997 1998 1999 2000 2001 2002 2003 2004 2005 2006 2007 2008 2009 2010 2011 GT 5.0L 4.6L V8 Mustang Roush & Saleen Vehicles. Made in the USA!